With winter darkness coming on, I recommend this book as a tonic to the spirits. Black Dog & Leventhal Publishers, hard cover, 240 pages, more than 500 color photos and illustrations, $29.95. 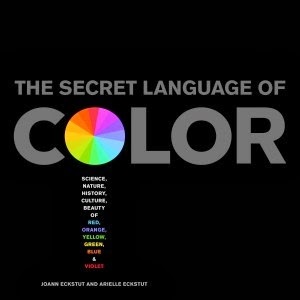 In their engaging and comprehensive volume, authors Joann Eckstut and Arielle Ekstut explore the subject of color from every imaginable angle -- spiritual, biological, chemical, sociological, artistic and historical, to name but a few. Open the book to any page and you'll find a plethora of diverse images and intriguing insights. The chapter on red is particularly vibrant, with photos of and informative notes on a blazing Russian revolutionary poster, a gathering of cardinals at the Vatican, a matador at work, and the sparkling ruby slippers from the Wizard of Oz. Violet, Elizabeth Taylor's famously favorite hue (as well as mine), is noted as the color of royalty, and is passionately described as "exquisite, delicious, and desirable." Each of the six colors of the visible spectrum has its own chapter, alternating with sections covering broader subjects: earth, the universe, plants, humans and animals among them. Along the way, short sidebars answer questions such as "How do animals see color?" and "Why are waves white? ", and reference expressions like "red herring", "green with envy" and "talk a blue streak". If you are enchanted by color, this is the book for you.